Today is one of the auspicious day for the GSB’s known as Ashad Ekdashi.Ekdashi is the eleventh day of the fortnight after the full moon.Don’t know much about the same.Many vegetarian delicacies are prepared on this special day like Gajbhaje(preparation made with colocasia leaves and assorted veggies like Bamboo,chana,yam,hogplum etc),Gharai and many more.For breakfast usually Khotto or Khottige is prepared(Steamed idli in the jackfruit leaves) with a combination of Hinga chutney.Coming back to the recipe,Ponsa or ponosu means Jackfruit and gharai is a sweet dish or payasam prepared out of it.Usually when there is jackfruit in abundance we saute it with ghee and jaggery and store it in the fridge and use it as and when required….Since I ‘m down with flu my Amma parceled me all the delicacies today. I thank her from the bottom of my heart.Sometime back I had posted Phonsa mulik.Refer here for the recipe. Heat 2 tbsp ghee and saute the jackfruit pieces for 6-7 minutes and keep it aside. Heat remaining ghee and roast the rawa until you get a nice aroma. Add thin coconut milk,cashewnuts,once the rawa is little cooked add jaggery,take a boil. Add jackfruit pieces,thick coconut milk,cardamom powder,raisins and take a boil. You may also roast the dry fruits in ghee and add it later as a garnish. If the kheer is thick you may add little thin coconut milk or water to adjust the consistency. 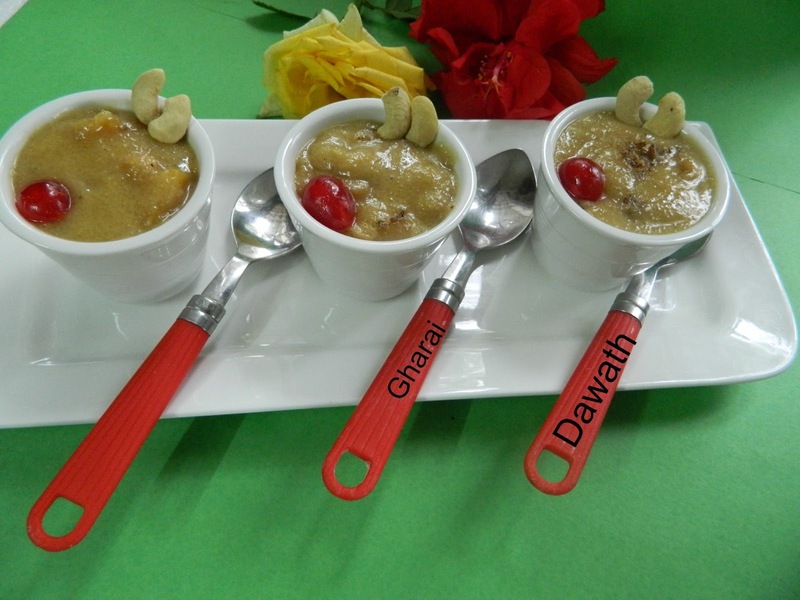 If the kheer is thin add 1-2 tsp of rice flour diluted in water and take a boil.